Eat Your Worms: The Upside Of Parasites Evidence has been mounting that intestinal parasites can actually be a good thing for people with inflammatory bowel disease, because certain parasitic worms seem to help the intestine heal. Now, new research yields clues to why the treatment may work. 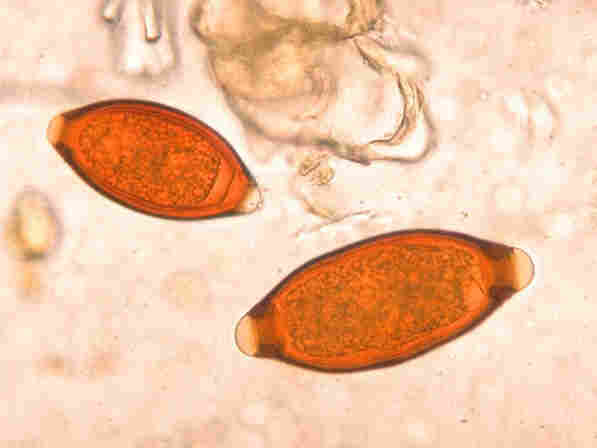 Eggs of the parasite called the human whipworm, responsible for Trichuriasis, a disease that affects the large intestine and causes gastrointestinal problems. Drug companies are now trying to create parasites for treating inflammatory bowel disease. For years evidence has been mounting that intestinal parasites can actually be a good thing for people with inflammatory bowel disease because certain parasitic worms seem to help the intestine heal. Now scientists think they've found at least one reason why this is so, thanks to a man who has spent years treating his own bowel disease with worms. Years ago, that man placed a call to P'ng Loke, a parasitologist who was then working at the University of California, San Francisco. "He had moved into the Bay Area and basically was looking for someone who works on worms, and so he called me and convinced me to have lunch with him," Loke recalls. Over lunch, the man told Loke a remarkable story about how he'd recovered from ulcerative colitis, a bowel disease in which the immune system appears to attack the lining of the colon, causing devastating ulcers. And for this man, Loke says, the usual treatments, including steroids, hadn't helped. "So he was being faced with the options of really severe immune suppressants or a colectomy," the removal of his colon, Loke says. But this man was a young entrepreneur with his own ideas. He'd run across the work of scientist Joel Weinstock who is now at Tufts Medical Center in Boston. Weinstock had done something that seemed bizarre: He had started using parasitic worms to treat people with ulcerative colitis. Could parasites be the shadowy hands that pull the strings of life? Radiolab uncovers a world full of parasites and explores nature's moochers, with tales of lethargic farmers, zombie cockroaches and even mind-controlled humans (kinda, maybe). And we examine claims that some parasites may actually be good for you. "So people would swallow microscopic eggs, and the eggs then hatch within the GI tract, and that living agent that comes out is capable to interact with the host's immune system," Weinstock says. Weinstock thought these parasites might help because in places where they are common, inflammatory bowel disease is rare. His hunch turned out to be correct: The people in his study got better. Loke says that was good enough for the entrepreneur in San Francisco, who started looking for his own source of parasitic worm eggs. "He managed to find a parasitologist in Thailand who was willing to help him obtain these eggs, and then he infected himself," Loke says. And he too got better and was feeling fine by the time he had lunch with Loke. But he wanted scientists to figure out why the cure had worked. So he offered to let researchers study his intestine over the next few years. During that time, the worms began to die off and the man's disease came back. So he took another dose of worm eggs and got better again. Through it all, Loke and his colleagues were collecting blood and tissue samples from the man. Infections of Trichuris trichiura, commonly called human whipworm, are more frequent in areas with poor sanitation and tropical weather. 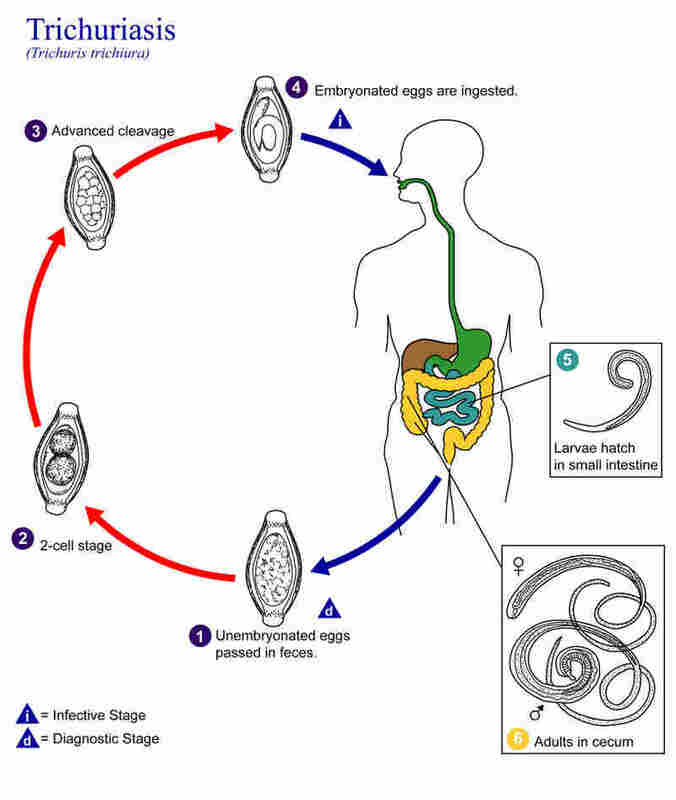 This illustration, from the CDC's Division of Parasitic Diseases and Malaria, explains the life cycle of the parasite. (1) Eggs are passed with the stool. (2) In soil, the eggs divide into two cells, then further divide (3) until they become embryonated (4) and are capable of infecting. Eggs are infective between two weeks and a month and can be ingested via soil-contaminated hands or food. They hatch in the small intestine (5), and adult worms attach themselves to the walls of the colon (6), where they can live for about a year. Female worms shed 3,000 to 20,000 eggs per day. "What we found was that after worm infection, the regions of the colon that were previously not making mucus, were now making mucus again," he says. That's a key factor in healing, and it looked like the mucus came back because the worms were causing the body to produce a substance called IL-22. Weinstock says that makes sense. "This is a molecule that promotes epithelial growth and healing and perhaps does other things to the immune system that would be potentially beneficial," he says. Weinstock says other studies suggest parasites can regulate the immune system in ways that prevent it from going wild and attacking healthy tissue, and he says it's likely that human evolution took that into account. "Humans have had parasites ever since we evolved from living in caves or swinging from trees or however it used to be, and disrupting these relationships probably had consequences," he says. Weinstock says drug companies are now trying to create parasites that would actually be approved by the FDA for treating inflammatory bowel disease. The research appears in the journal Science Translational Medicine.